Why is the Chesapeake Bay so important? The Chesapeake Bay is the largest estuary in the United States, and second largest in the world. As an estuary, its mix of fresh- and saltwater is home to a diverse wildlife of over 3,700 species of plants, fish, and other animals. Recognized as a “national treasure,” the Bay represents one of the most significant ecosystems in the country. The Bay is also an important source of economic resources. It provides an enormous seafood industry, numerous sea ports for commercial shipping, and opportunities for various recreational activities. Recent attempts to quantify the value of the Bay in economic terms estimate the value of the Bay at over $1 trillion when accounting for all of these benefits, and studies suggest that a restored Bay could net an increase in economic output by creating stronger fish populations, increasing annual tourism, and reducing pollution removal and water treatment costs. Despite the significance that the Chesapeake Bay represents, the water quality of the Bay is plagued by pollution, which has had an adverse impact on local plant and wildlife, seafood industry, tourism, and overall human interaction with the Bay. The water quality is so poor that the Bay is included on the federal Impaired Waters List of the Clean Water Act. Runoff- water not absorbed by the ground- carries excessive nutrients and other pollutants from throughout the Bay Watershed to the Bay and its tributaries. Past efforts to curb pollution runoff have in large part failed, despite growing attention to the issues. The Bay TMDL, issued in December 2010, represents the most aggressive attempt yet to restore the Bay, but it remains to be seen what effect this strategy will ultimately have. 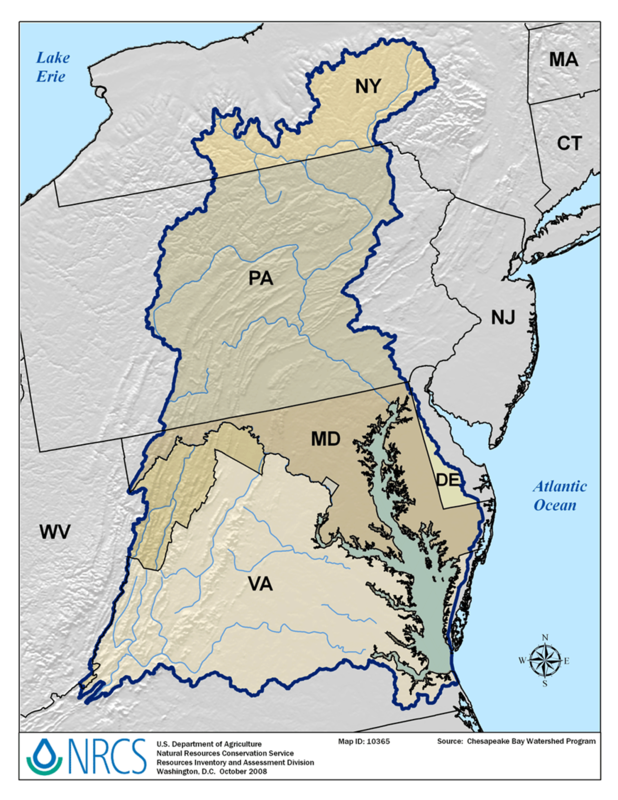 How large is the Chesapeake Bay Watershed? The Chesapeake Bay itself is roughly 200 miles long, extending from the Susquehanna river basin to the Atlantic Ocean. The Chesapeake Bay Watershed, however, is approximately 64,000 sq. mi. in size and spreads across six states and the District of Columbia. It spans from Norfolk, Virginia in the South to Cooperstown, New York in the North, and east from the Delmarva region west to the Appalachians. The Watershed is home to 17 million people, with an estimated growth of 130,000 people per year. Nutrients play an essential role in the health of the Bay’s water, wildlife, and wildlife habitats. Too much of these nutrients, however, create adverse conditions in the Bay. The major nutrients in the Bay are nitrogen and phosphorus. Excess nitrogen and phosphorous in the Bay Watershed result in dead zones, or waters with low levels of oxygen. These conditions can lead directly to fish and shellfish die-offs. Poor water quality associated with high nutrient levels in the Bay Watershed act as stressors for aquatic organisms, and can make certain organisms, such as oysters, more susceptible to disease. Another major Bay pollutant is sediment. Sediment primarily enters the Bay through erosion and runoff. Excess sediment in the Bay Watershed blocks sunlight from reaching aquatic organisms, such as underwater grasses, and can stifle organisms, such as oysters, which naturally reside on the Bay floor. Underwater grasses, or submerged aquatic vegetation (SAV), and oysters provide habitat and food for other aquatic organisms, and contribute to water quality in the Bay Watershed. Thus, water quality is further degraded as excess nutrients and sediments in the Bay Watershed contribute to die-offs of SAV and oysters. The Bay TMDL addresses these three pollutants specifically, as annual nutrient and sediment loads to the Bay are millions of pounds over levels the EPA deems healthy. What are the major sources of nutrient pollution in the Bay? For Bay-wide nitrogen loads, agriculture contributes 38% of nitrogen in the watershed, wastewater treatment plants and private septic systems contribute 23%, air pollution 21%, and urban/suburban stormwater runoff 16%. The remaining 2% is from natural sources. Bay-wide phosphorus loads are similar to nitrogen. Agriculture contributes 45% of phosphorus in the Bay. About half of this load comes from manure runoff, and half from chemical fertilizers. Urban/suburban stormwater runoff contributes 31% of phosphorus in the watershed, while wastewater treatment plants and industrial wastewater contribute 21%. The remaining 3% comes from natural sources. What is the Bay TMDL and what is its significance? The Chesapeake Bay Total Maximum Daily Load, or (“Bay TMDL”), is the federal framework for regulating pollution in the Bay. The Bay TMDL sets limits to how much nitrogen, phosphorus, and sediment can enter the Bay and still meet its water quality standards. The Bay TMDL is the largest and most comprehensive TMDL ever written. It consists of seven Watershed Implementation Plans (WIPs) for each Bay State, requires milestone updates every two years, and establishes various federal “backstop measures” in the event that a Bay State fails to make sufficient progress toward meeting its reduction targets. The Bay TMDL requires that each Bay State ensures that all the necessary practices to meet the reduction targets will be in place by 2025, and imposes an intermediate goal that at least 60% of those practices will be implemented by 2017. With these practices in place, the objective is that the water quality in the Bay will improve over time. Depending on the type of pollution and the extent of the damage caused to the environment, improvements are expected to take anywhere from a few years to several decades. Why is the EPA concerned with the Bay? Since the 1970’s, efforts to address Bay pollution have been ineffective. Between various iterations of the voluntary agreements of the Chesapeake Bay Commission, and efforts by state and local governments to manage water pollution on a local or regional level have not resulted in any significant improvements to the water quality of the Bay. Due to this lack of improvement, the Environmental Protection Agency created the Bay TMDL in December 2010 after citizen lawsuits and a 2009 presidential Executive Order compelled the EPA to exert its authority under the Clean Water Act. The EPA, in coordination with each of the Bay States, worked to establish Watershed Implementation Plans (WIPs) for each Bay State which sets goals and requirements based on each state’s pollution reduction targets. Where does the EPA get its legal authority to get the Bay States to manage its reduction targets? The Clean Water Act (“CWA”) gives the Federal Government authority to regulate interstate waters, and the Federal Government exercises that authority through the EPA. Under the CWA, either the EPA or the states set a designated use for each body of water, and determines a water quality standard required to satisfy that use (typically, large bodies of water are divided in different sections and are assigned different uses). Whenever a body of water is too polluted to meet its water quality standard, section 303(d) mandates that that body of water be placed on the Impaired Waters List. For every body of water on the impaired list, a TMDL must be written, either by the state or by the EPA. Because of the complexities and specificity of the Bay TMDL, several groups within the agricultural community and state governments outside the Bay Watershed filed lawsuits to challenge the Bay TMDL as an overreach of the EPA’s authority under the CWA. In 2013, the District Court for the Middle District of Pennsylvania ruled in favor of the EPA, and in June 2015, the Court of Appeals for the Third Circuit affirmed that decision in its entirety. Data for nitrogen source loads comes from the Chesapeake Bay Foundation, www.cbf.org/about-the-bay/issues/dead-zones/nitrogen-phosphorus. Data for phosphorus loads comes from the National Research Council’s Achieving Nutrient and Sediment Reduction Goals in the Chesapeake Bay, 2011, p. 29.